The Master of Divinity (MDiv) degree is a 72-unit graduate professional degree which prepares students to engage fully and with confidence in ministry, chaplaincy, and related professions as well as further academic work. 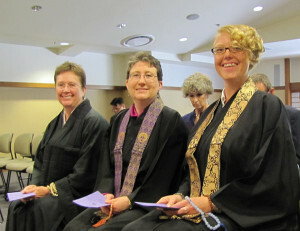 The MDiv program provides a unique opportunity for students to build a rich and nuanced understanding of Buddhist traditions at a Buddhist seminary, and, through its relationship to the GTU and its member schools, a well informed understanding of other faith traditions and the dynamic religious and spiritual landscape of contemporary society. Diversity and dialogue are an essential part of the program and support its aim — to develop skilled, thoughtful and effective leaders grounded in the Buddhist tradition, able to think critically and respond constructively to the needs of a changing world. produce research projects and develop communication skills through writing, public speaking, and dharma talks. All students are required to complete a range of courses across six subject areas to provide a foundational basis for Buddhist ministry, chaplaincy, and religious leadership in an increasingly interfaith and intercultural world. Students from all Buddhist traditions are welcome in the IBS MDiv program. Those seeking ministerial ordination in a specific tradition should consult with their community to ensure course work meets ordination requirements. For those students wishing to prepare for Jōdo Shinshū ministry and/or professional chaplaincy, specialized tracks of study provide additional structure to the MDiv program. Additionally, students may consider completing a concurrent certificate program to guide and focus their studies. A Bachelor’s degree (BA) or its equivalent from an accredited college or university; or evidence of having completed equivalent studies under a different educational system. Graduate Record Examination (GRE) scores from within the last five years. GRE Verbal scores should be at least 150. Three letters of recommendation attesting to the applicant’s ability to do graduate-level work and familiarity with Buddhist thought and/or practice. A statement of purpose describing the applicant’s reason for pursuing graduate study at IBS and what goal they wish to accomplish through the MDiv program. A non-refundable $50 application fee, payable to Institute of Buddhist Studies. A complete application and personal information form, available via the IBS’s website.